Santos previously served as an appointee to the Board of Trustees and currently serves on the Commission of Workforce Development. He is running for a four-year seat on the Board of Trustees. Santos founded a structural engineering firm that he said employs many former City College students. Santos hopes to return City College to a fully accredited and unsanctioned institution, ensure the sustainability of the school and work with the private sector to contribute to the school financially. “Without full accreditation CCSF will fail to serve as an institution that serves the community. This must be the first priority of the new board,” Santos said. Thea Selby co-founded the Lower Haight Merchant and Neighbor Association and is currently a California High Speed Rail Authority Board member and a chair of the San Francisco Transit Riders. She is running for a four-year term on the Board of Trustees. “I know what it takes to be a good board member and I want to make the Board of Trustees a good board,” Selby said. Selby wants to fight to keep City College accessible for everyone. “This (school) could be the only alternative for a lot of people. City College is San Francisco,” Selby said. Selby’s goals if elected include maintaining accreditation, making City College financially stable and working on a solid marketing plan to help with enrollment. She believes that this is ultimately about students and wants them to have a say in what goes on at City College. Current City College student Dan Choi is a political activist. He is a vocal music major and a disabled combat veteran known for his fight for LGBT equality and the repeal of “Don’t Ask Don’t Tell.” He is running for a four-year term on the Board of Trustees. Choi believes the programs at City College help homeless people, immigrants, LGBT runaways and other groups in need of a new start. “I don’t just name a long list of constituents. I am those constituents,” Choi said. He wants to give City College’s fight to remain accredited national attention. “I need everyone paying attention to CCSF. We have to take on the ACCJC on a national level,” Choi said. Though Choi remains optimistic about City College remaining open and accredited, he does not believe that the fight is over. Choi also wants to continue to campaign for enrollment and fight to keep course offerings diverse for City College students. Brigitte Davila is president of the District 11 Democratic Club, vice president of the Latino Democratic Club, member of the statewide political action commitee for the California Faculty Association and a faculty member at San Francisco State University. She is running for a four-year term on the Board of Trustees. Davila said a number of her students are transfers from City College and finds they are a diverse group. She overhears conversations often during her daily commute on the Muni about City College. There are misconceptions and misunderstandings of the current situation and many people that she has spoken to believe that City College has lost its accreditation. If elected Davila hopes to handle the two major problems City College is facing, accreditation and the drop in enrollment. “We have to face the two prong problem of accreditation,” Davila said. Thomas Moyer is a San Francisco State University graduate. He is running for a two-year seat on the Board of Trustees. Moyer hopes to be a voice to the supporters of City College. Moyer wants to maintain accreditation, grow student enrollment to bring in more revenue into the school, and improve tech infrastructures to improve efficiencies. “It is clear to me that there are not enough people on the board willing to make the right kinds of sustainable decisions that will keep CCSF available to those seeking higher education,” he said. Aragon is a political activist and a community organizer in San Francisco and currently serves as the President of the Richmond Democratic Club. She is running for a 4-year term on the Board of Trustees. Though high school was a struggle for Aragon, after enrolling in De Anza College her academic career vastly improved. She benefited from programs like Extended Opportunities Programs and Services, which helped her adapt to college and Disabled Student Programs and Services, where it was accessed she had dyslexia, dysgraphia and dyscalculia. She eventually transferred to San Francisco State University, earning her Bachelor of Arts with a dual major of American Studies and Urban Studies. Aragon decided to enroll in classes at City College last fall when enrollment fell in the midst of the accreditation crisis in support of the school that she believes offers so much to the community. During her time at City College, Aragon spoke to a variety of students, all of whom had different goals and situations. Some were working through school, learning a trade or participating in specialized programs. Rizzo was the former president of the Board of Trustees. Since the special trustee was appointed, Rizzo has been working with other elected officials to gain support for City College. He has worked closely with Congresswoman Nancy Pelosi and Assemblymember Tom Ammiano, as well as the San Francisco Board of Supervisors. He has also spoken with community members to keep them informed regarding the accreditation situation at City College. “I think it is important to build that support,” Rizzo said. He hopes to finish the job he started in regards to maintaining the school’s accreditation and remove the threat altogether. Anita Grier was the former vice president of the Board of Trustees. Grier has vast experience as an educator and administrator. She has taught special education and was vice principal at Burton High School. She served the San Francisco Unified School District as a program manager and program administrator. Grier hopes to continue her fight to maintain City College’s accreditation. She is motivated by the students who have worked hard to further their education. As a board member, Grier hopes to meet with legislative and community members to lobby for internal reform. Amy Bacharach is a graduate of Emerge California and am an elected delegate for the 19th Assembly District of the Democratic Party. 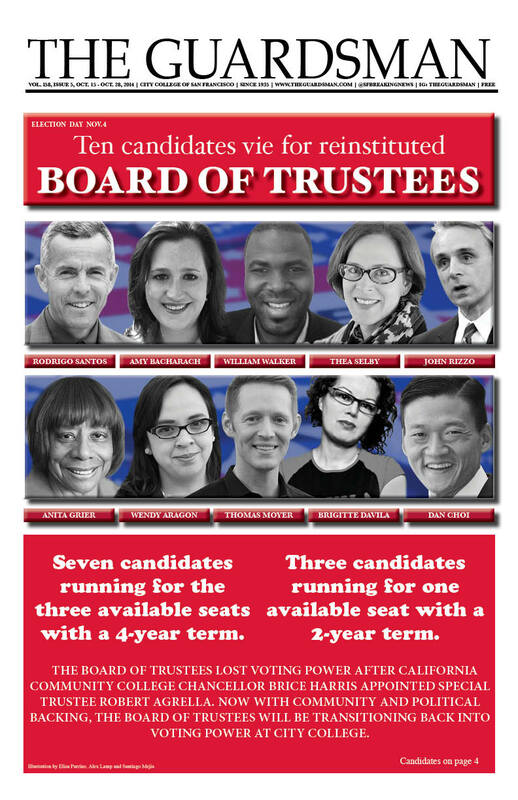 “City College is ripe for new perspectives, and I believe that if strong, independent, pragmatic, unifying leaders fill the seats this year we’ll have a greater chance at having the Board reinstated sooner rather than later. I am one of those leaders,” Bacharach said. Her primary objective is to keep City College open and accredited. “My vision is for the elected Board to move forward with strengthening the institution as a whole, making sure that the community’s needs are being met with high-quality education and training and that the college is on track for financial stability, Bacharach said. Once the school’s situation has been stabilized, Bacharach hopes to create a network of alumni to mentor current City College students to create internship opportunities. “My goal is to be part of the solution to the past problems and to make City College a model for other community colleges,” Bacharach said. Former City College student William Walker served as the student trustee before graduating City College. He is currently working in the counseling department at Foothill College for the Early Alert Retention Program. “I have ten years of board experience and 20 years of community organization experience,” Walker said in regard to his qualifications. He worked hard to engage students while he attended City College by moderating the Save CCSF Facebook page and blog. Walker believes communication is key, between stakeholders, students, staff and faculty.